It is indeed rare that Festool has a sale on their new tools, though we do see discounts on their reconditioned tools once a year. The sale will drop the price of the Kapex from $1,400 to $1,260. If you have been thinking about adding the Kapex to your arsenal, now would be the time to do it. 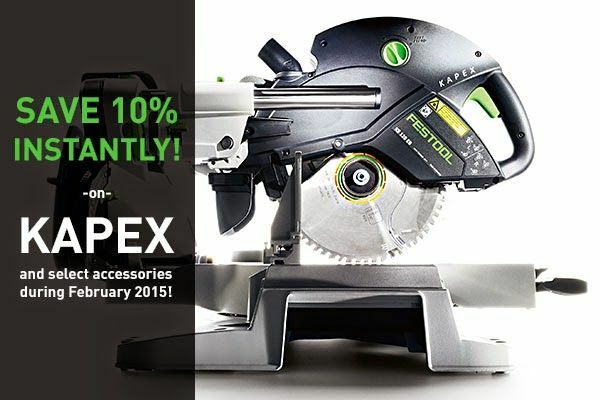 Additionally, select Kapex accessories will also have a markdown of 10% for the month of February. Items include the Festool Kapex UG Mobile Miter Station (#497354), MFT/3-MINI (#495565), and all Kapex blades. The Kapex February promotion is available at participating dealers in the U.S. and Canada. Full details on the promotion can be found at www.festoolusa.com/kapex.